José Mourinho announced his departure from the club in the beginning of the June, but it didn't take more than a full month for Real Madrid to find a new manager. 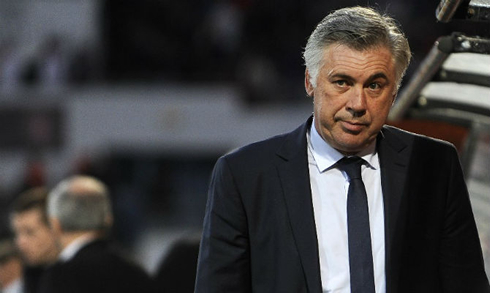 The former PSG coach Carlo Ancelotti will take it from here and wasn't afraid to admit that his ultimate challenge is to lead the club to a much-wanted success in the UEFA Champions League. Real Madrid's new coach for the upcoming season has been revealed earlier this week and it's surely a well known face for all football enthusiasts around the World. 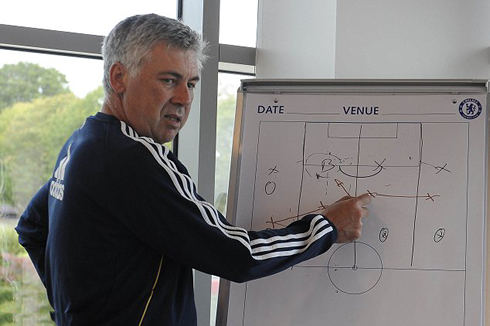 Carlo Ancelotti, a two times winner of the UEFA Champions League with AC Milan in 2002-03 and 2006-07, is expected to start a new era in Real Madrid as soon as the team kicks off with the pre-season trainings. The Italian coach has managed several top European clubs in his career, from Juventus to Milan, following a short passage in Chelsea FC and more recently on PSG. At the Merengues reign, Ancelotti will have the opportunity to work with Cristiano Ronaldo on his prime, as well as a packed roster of highly talented stars like Mesut Ozil and Karim Benzema. Is the 54-year old Italian ready for the magnitude of the challenge he has been put ahead? It has been a long year for the Merengues, but the club is finally cleaning the house and getting ready for next season. José Mourinho's departure didn't exactly catch anyone off guard and Florentino Pérez first choice to replace the Portuguese has quickly been announced as being the Italian manager Carlo Ancelotti, a man who has recently found success in winning the French league with PSG. With this sorted out, Mourinho returns to his former club Chelsea FC and to the English Premier League, while Real Madrid gets an opportunity for a fresh start, hopefully with a peaceful and less troubled journey under the orders of Ancelotti. Expectations for next season are really high at this point and Real Madrid odds for getting some silverware before the 2014 FIFA World Cup takes place are currently available to be picked at an interesting 1.4 rate. The Portuguese star continues being linked with a summer transfer to Manchester United and that's definitely an issue that will bring Ancelotti's attention in the next days and weeks, even though he didn't approach it just yet during his first words as a Real Madrid manager. 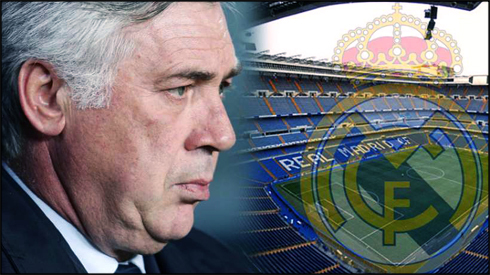 Carlo Ancelotti's contract with Real Madrid will tie him to the club for the next 3 years and will allow the Italian to earn around 8 million euros per year, according to the French newspaper "Le Parisien". The former French International, Laurent Blanc, will replace Carlo Ancelotti in Paris-Saint Germain, but that won't avoid Real Madrid from having to pay a compensatory fee to the French champions of roughly 4.5 million euros. Everyone knows that there is no trophy more wanted by Real Madrid than the Champions League. José Mourinho has failed to deliver that particular Merengues' obsession but Florentino Pérez has quickly shown a great amount of confidence on the new Italian at the helm to lead the club to European glory in a near future, despite how hard the challenge may actually become. 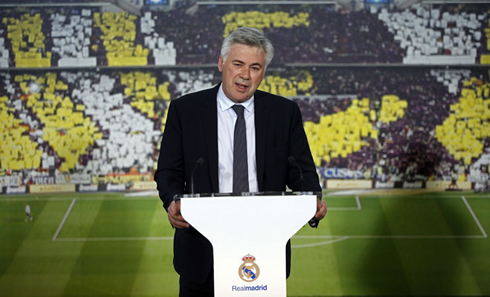 Carlo Ancelotti had a short statement to the journalists on his press-conference welcoming and started by promising that he will be improving his Spanish really soon. 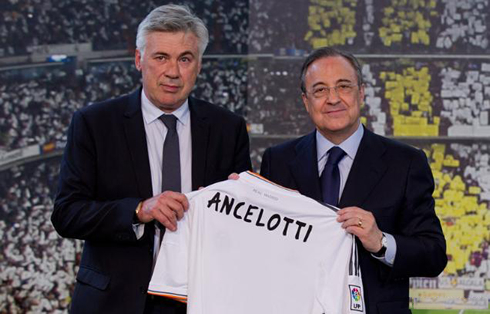 Ancelotti: "I'm very excited. First of all, I'm sorry for my Spanish but it will be better very quickly. I have a very clear objective in hands and that's quite simply to win titles at the same time as the team plays spectacular football. That's what this club is all about and that's a tradition I pretend to respect and follow", remarked the new Real Madrid coach, who will most likely count with Zinedine Zidane on his side as assistant manager right at the beginning of next season. Cristiano Ronaldo is now on vacations, but he'll soon return to Madrid to kickoff with his pre-season preparation. In the meanwhile, you can watch Galatasaray vs Real Madrid, Brazil vs Spain, Uruguay vs Italy and USA vs Guatemala, all matches available at our soccer live section.